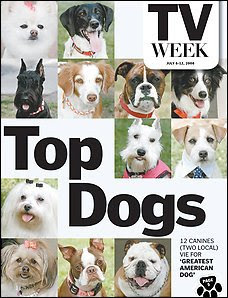 While it is a commonly known fact that all dogs go to heaven, thanks to the Tiffany Network a select dozen are also going to a new reality show. Twelve extraordinary teams of dogs and their owners -- from pageant competitors to those simply trained at home -- will live together and compete against each other in challenges that put the owners' ability to train their dogs to the test. Each week the judges eliminate one dog and their "master" (or is it the other way around?). The last remaining team will walk away with a $250,000 cash prize and the title of "Greatest American Dog." 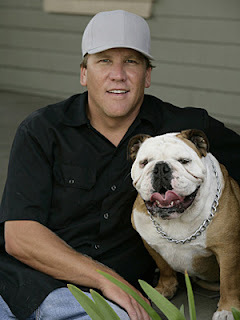 And speaking of the beach, we at Needtovent have a favorite competitor -- a fabulous English Bull Dog named Tilman who loves to hang out with his owner to do a little skimboarding when he isn't skateboarding or snowboarding. If you love dogs this is a show worth collaring. If you don't love dogs then you must be a card-carrying militant member of the Black Panthers, a Republican's Prada-shod Trophy Wife or a knife-wielding Korean Chef -- may God have mercy, respectively, on your soul, on your sole and on your Seoul. One last thought -- wouldn't it be terrific if Fred Willard was brought in to do the commentary for the finale? Here Here on the dog comment. However, whenever I see the term "reality show", I get very suspicious, sceptical and downright offended. Those shows are not reality, in fact they are staged drama. But alas I will not climb up on the old "soap box" as to produce entertaining high quality shows would require talent, effort and oh yeah, a desire. As you know we have three untalented lovable mutts! Pleeeeeeeeaaaaase. You can't compare the charisma levels of Travis (of TRAVIS & PRESLEY) and the boring host. One is a stud and one is a dud. I'm confident you can figure out which is which. And, if CBS is reading this, than maybe you just gave them a great idea for the host of season 2. Not only is his nickname appropriate, he attended The Julliard School and he briefly served as a TV game show host (HOLLYWOOD SQUARES -- 1983-1984). Should you have any suggestions, please do not hesitate sending them. "If you don't love dogs then you must be a card-carrying militant member of the Black Panthers, a Republican's Prada-shod Trophy Wife or a knife-wielding Korean Chef -- may God have mercy, respectively, on your soul, on your sole and on your Seoul." Your very kind and supportive words certainly made our day here at Needtovent. What a way to start off the work week! We thank you for writing in and we hope you will continue to check both our blog and our website for future postings.